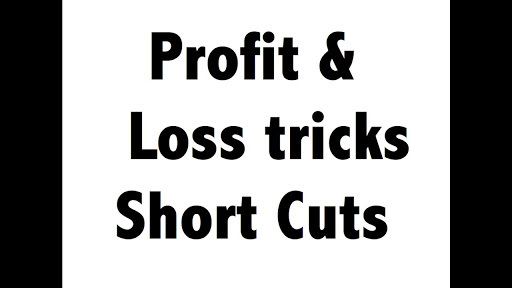 Shortcut tricks on profit and loss are one of the most important topics in exams. Competitive exams are all about time. If you know how to manage time then you will surely do great in your exam. Before doing anything we recommend you to do a math practice set. Choose any twenty math problems and write it down on a page. Using basic math formula do first ten maths of that page. You also need to keep track of the time. After solving all ten math questions write down total time taken by you to solve those questions. Now read our examples on profit and loss shortcut tricks and practice few questions. After finishing this do remaining questions using profit and loss shortcut tricks. Again keep track of Timing. This time you will surely see improvement in your timing. But this is not all you need. If you need to improve your timing more then you need to practice more. We all know that the most important thing in competitive exams is Mathematics. That doesn’t mean that other topics are less important. You can get a good score only if you get a good score in math section. You can get good score only by practicing more and more. You should do your math problems within time with correctness, and you can do this only by using shortcut tricks. But it doesn’t mean that you can’t do math problems without using any shortcut tricks. You may have that potential that you may do maths within time without using any shortcut tricks. But so many other people may not do the same. So profit and loss shortcut tricks here for those people. 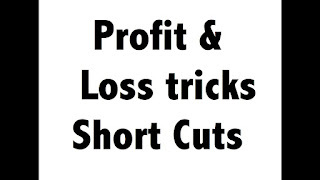 Here in this page we try to put all types of shortcut tricks on profit and loss. But it possible we miss any. We appreciate if you share that with us. Your little help will help so many needy.